On Saturday, March 25, 2017, Rep. Ken Buck (CD4) said that he did not receive money from the Koch Brothers, and if he did, he was “not aware of it.” The person who asked the question even specified the amount of $10,000. Didn’t he think we’d check? The info is buried within the pages in the site, so it is difficult to copy and paste a direct link. You have to follow this path to get to it: Go to http://fec.gov. 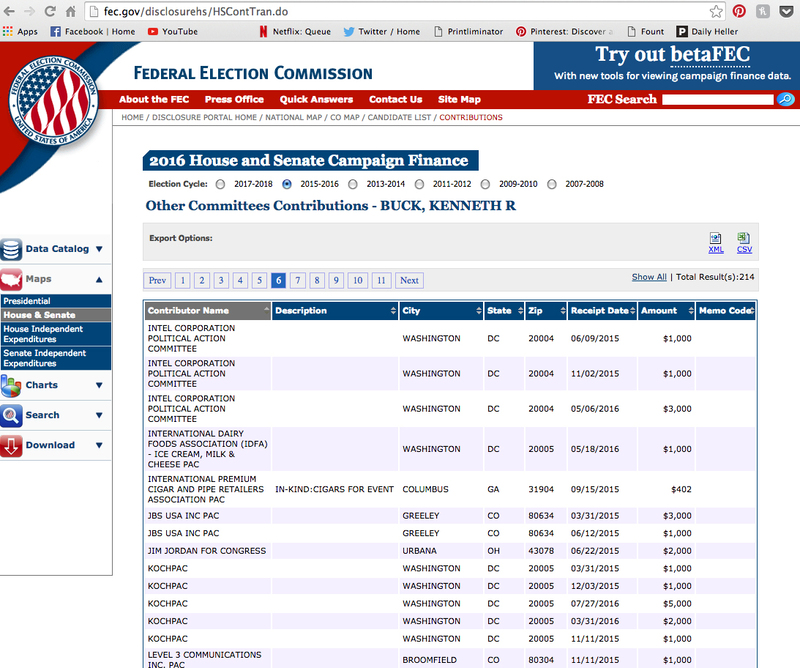 Click the link marked “Campaign Finance Disclosure Portal.” Then click “Graphic Data Presentations”, and then “House and Senate Map.” Choose the 2015-2106 campaign cycle. Click Colorado, then click 04 on the map. Where it says Ken Buck, click the link marked PAC. It’s on page 6. There are 5 contributions from KochPac for a total of $10,000.